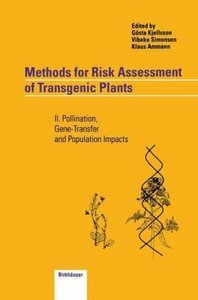 The present work is a continuation of the work initiated in Autumn 1991, which resulted in the book, published by Birkhauser Verlag in 1994, entitled: Methods for Risk Assessment of Transgenic Plants. I. Competition, Establishment and Ecosystem Effects. Already when the work on volume 1 started, it was obvious to the authors, that not only the physical establishment of a transgenic plant outside the cultivated area was important for risk assessment, but also the possible gene-transfer from transgenic plants to other plants had to be considered. It was then decided to write a second volume on test methods, as a complement to the first, covering the main topics: Pollination, gene-transfer and population impacts. The main user groups for this volume are scientists and students working with plant population genetics and risk assessment and administrators with responsibility for legislation of transgenic plants. In order to cover such a broad range of topics, specialist knowledge was required. Therefore, colleagues in Denmark and Switzerland, working in these fields in relation to the concerns of using transgenic plants, were asked to participate. The result was a Danish-Swiss cooperation. A list of contributors to the book and their addresses is shown on p. VII. Financial support, which made the work possible, was given by: The National Environmental Research Institute, Denmark, the Federal Office of Environment, Forest and Landscape, Switzerland, the National Forest and Nature Agency, Denmark, the Danish Environmental Protection Agency and the European Commission, DC XI. 1. Introduction.- 1.1. New developments.- 1.2. Main purposes of the book.- 1.3. How to use the method book.- 2. Glossary of terms and abbreviations.- 3. Categories and corresponding subcategories.- 4. List of subcategories with corresponding methods.- 5. List of methods with corresponding subcategories.- 6. Synopsis of subcategories and recommended methods.- 6.1. List of subcategories with corresponding references.- 6.2. List of categories with corresponding reviews.- 7. List of methods and their description.- 7.1. Organization of the description of the methods.- 7.2. List of methods.- 7.3. Description of methods.- 8. Genetic engineering techniques.- 8.1. Methods of DNA transfer.- 9. Inserted traits for transgenic plants.- 9.1. Herbicide tolerance.- 9.2. Pest tolerance.- 9.3. Pathogen tolerance.- 9.4. Changed flower characteristics.- 9.5. Changed metabolic content.- 9.6. Stress tolerance.- 9.7. Outlook for the future.- 10. Principles and procedures for risk assessment of transgenic plants.- 10.1. The theory of ecological risk assessment.- 10.2. Established and new concepts for ecological risk assessment of GMPs.- 10.3. Risk assessment and the type of environment.- 10.4. The role of modelling in ecological risk assessment.- 11. References.- 12. Subject index.